Like Turkish foreign policy, we could easily be accused of “tilting east” these days. Just after making our way to Fatih’s Öz Kilis, we soon found ourselves trawling the streets of the nearby Aksaray neighborhood in search of food from another southeastern Turkish city near the Syrian border, in this case Urfa. In Turkey, ancient Urfa (called Edessa in Roman times) is best known as the supposed birthplace of Biblical patriarch Abraham and the actual birthplace of Ibrahim Tatlises, the undisputed heavyweight champ of the Turkish Arabesque music scene. The city is also known as a major food spot, famous for its dried red peppers and its kebabs. During a visit a few years ago to Urfa – which seems to have two kebab houses for every resident – a local “historian” told us that the town was also the birthplace of yogurt and (perhaps more plausibly) çig kofte, both invented, he claimed, by Abraham himself (the Biblical figure, not the singing star). In Istanbul, Aksaray’s atmospheric Ragip Bey Street has over the years turned into Little Edessa, lined with a number of kebab joints and spice shops selling the fiery red peppers of Urfa. Following a good recommendation, we made our way to Urfali Haci Usta, a veteran kebab house on the street that has a large dining room decorated with plastic palm trees and walls painted a shockingly bright red. We sat down at table across from a mustachioed man in a black tank top who quickly struck up a conversation with us. Did we know, he asked us, that one of Barack Obama’s grandfathers came from Urfa? We didn’t put much stock in our new friend’s knowledge of the Obama family tree, but we did realize he might be a good guide for what and how to eat in the restaurant. 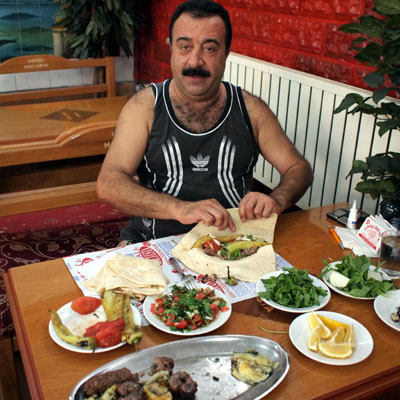 Like him, we ordered the patlican kebab, chunky discs of fatty minced meat that are interlaced on a skewer with big hunks of eggplant and which are then all grilled together. Our kebabs arrived accompanied by a mound of chewy flatbread and various small plates holding parsley, sliced onion, grilled tomato and peppers and an ezme (chopped tomato, onion and parsley) salad flavored with dried red pepper that gave it an intensely earthy and rich flavor. Our friend, meanwhile, got to work, separating the tender eggplant flesh from its charred skin and then placing it, some meat and a bit of everything else on the table on top of one of the flatbreads, which he then deftly rolled up into a monster wrap, washed down with a big glass of ayran. We followed suit, wondering as we bit into our scrumptious durum if Urfa might in fact also be the birthplace of the burrito. The Bible’s Abraham was known for his graciousness, his tent open on all sides to visitors. Once done with our food, our friend – in true Urfa style – invited us over for coffee, kunefe (syrupy shredded wheat wrapped around cheese) and conversation. We left the restaurant filled with good food and good cheer, hoping to find ourselves again drifting toward this part of Aksaray very soon. can u help us wher to got our iftar good food and not so expensiv ? and what special attractions u have in istanbul for the Eid ? wher to go in istanbul ? Ahlan wa sahlan! If you take a look here, you will find a recent post in which we recommended several spots for iftar. You might also want to check out the iftar scene in the Sultanahmet area (around the Blue Mosque), which is very lively. Likewise the area around the Eyup mosque up the Golden Horn (Halic). Have a great trip.